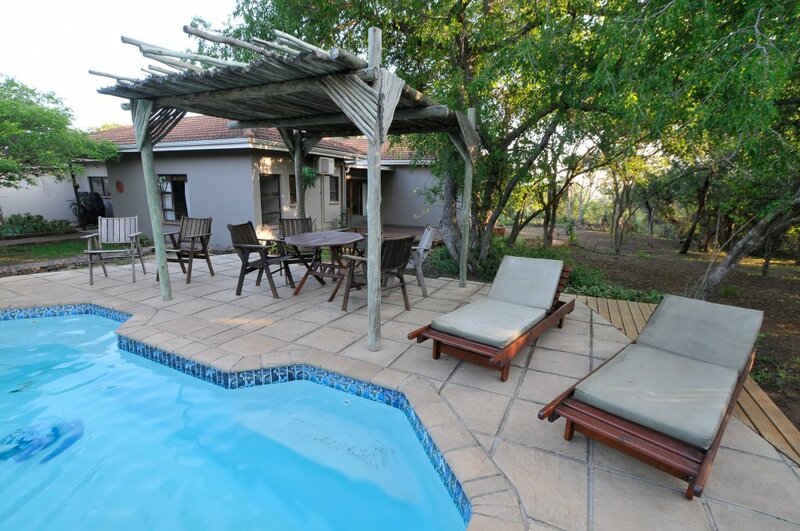 This private two bedroom home is 200 meters from the main Hluhluwe River Lodge and is ideal for a family of four or two couples. A fully equipped kitchen means that you can self cater and book meals at extra cost at the main lodge restaurant. 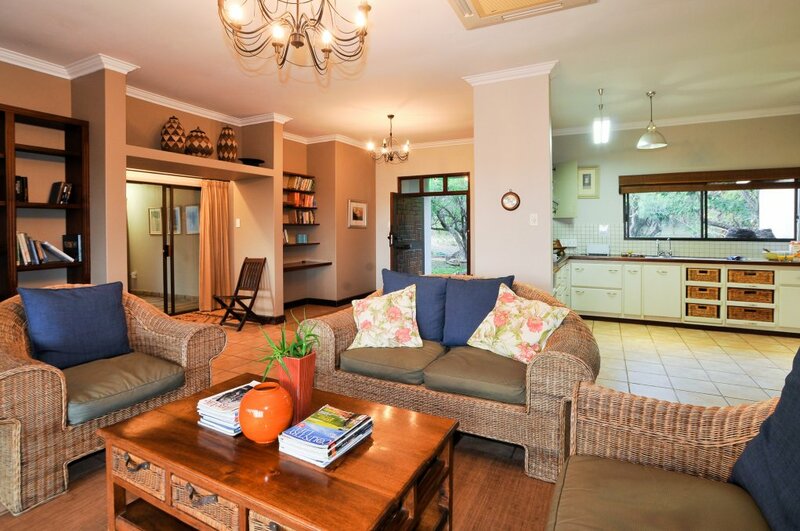 There is a swimming pool set in the garden and a large deck at the front of the house with an expansive view of the Hluhluwe River and floodplain. The deck is ideal for outdoor dinners with an outdoor counter and barbecue facilities. The kitchen is equipped with an oven, gas hob fridge freezer as well as a dishwasher. 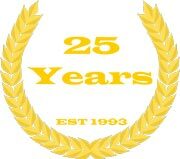 The house is serviced daily by a housekeeper who will make beds, tidy and wash dishes on a daily basis. There are two bedrooms, the main bedroom is en suite with a spacious bathroom with a victorian era bath, shower and toilet whilst the other room has only a en suite shower, vanity and toilet facilities. 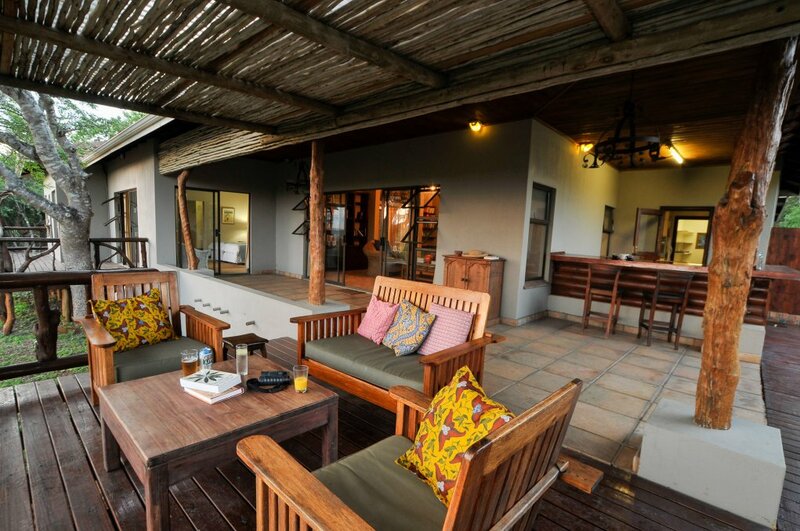 A spacious lounge gives way to a both a dining room and deck with views into the bush and swimming pool and the front entertainment deck. 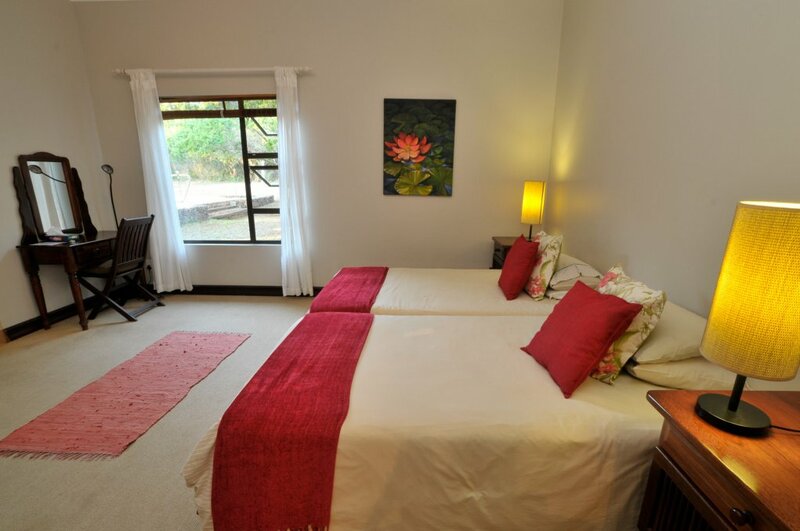 The main bedroom has an en suite bath, shower and outside shower whilst the second bedroom has only a shower. 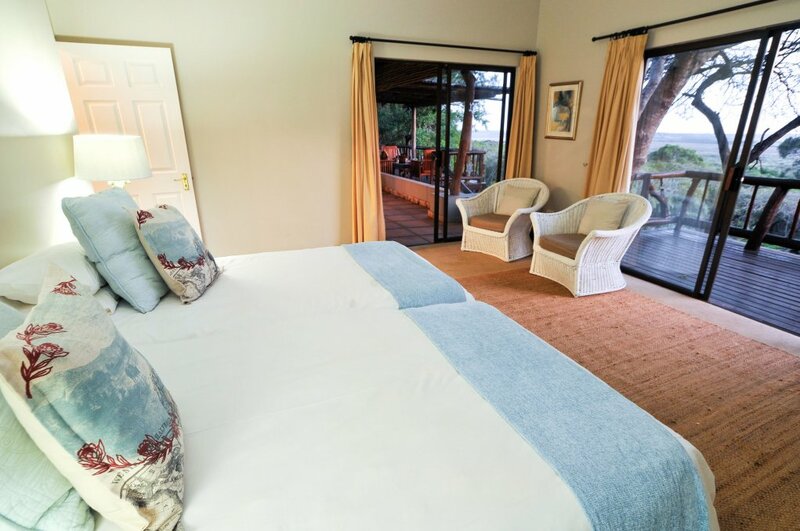 The main bedroom has a view of the front area of the garden whilst the second room has a window view of the pool area and bush beyond. There is an uncovered parking area that will fit two cars. 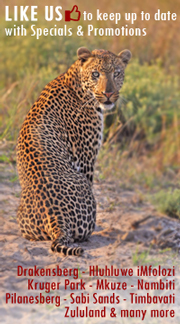 The restaurant and bar facilities at the main lodge are available to guests at Mkhulu’s House and meals may be booked in advance at the lodge reception at extra cost should you prefer to make use of the facilities there. 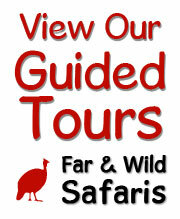 Reception staff at the main lodge will gladly assist you with booking any activities in the area. 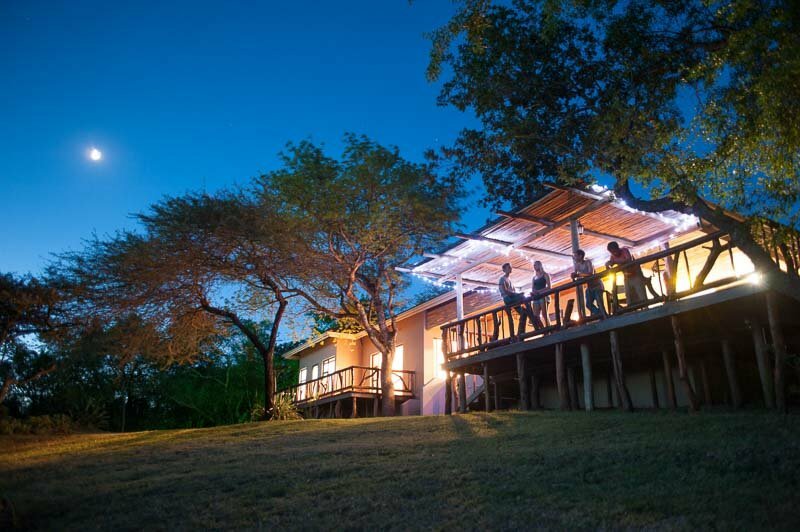 The view from the front deck overlooks the Hluhluwe river floodplain making the front deck and entertainment area a great place to relax and unwind with a good book and a pair of binoculars. 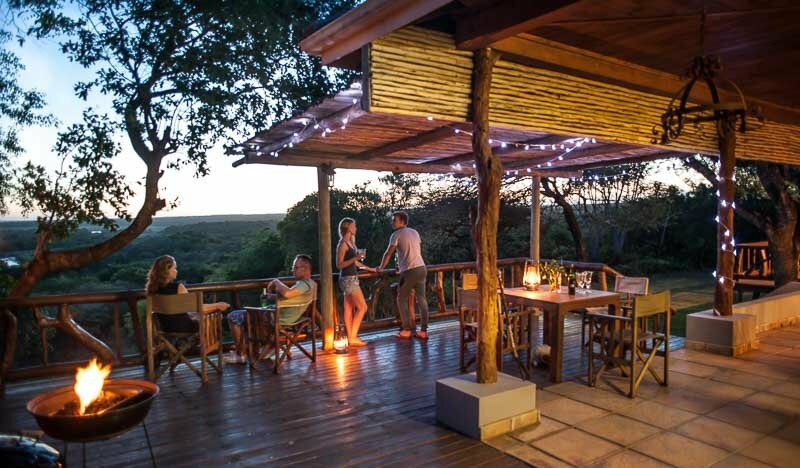 The privacy and spaciousness of the open plan environment is ideal for a family breakaway or two couples looking for a self catering home from home in the bush.